Cisco - WS-C3560-24PS-S WS-C3560-24PS-S Cisco Catalyst 3560 24 10 100 PoE + 2 SFP Standard Image. New Factory Sealed. 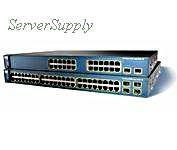 Cisco - WS-C3560-24PS-S CISCO - (WS-C3560-24PS-S) 24PORT 10/100+2port SFP POE SMI SWITCH -1 U RACK MOUNTABLE. REFURBISHED. IN STOCK. SHIP SAME DAY.